Manufacturer & exporter of copper threaded tee. Also offering copper item, copper pipe fitting, copper studs, copper tube fittings, copper sheet, copper nickel pipes, copper strip & copper threaded tee. We are an eminent name occupied in offering premium range of Copper Threaded Tees for Tubes to our clients. Additionally, client can get the offered assortment from us at very economical prices. 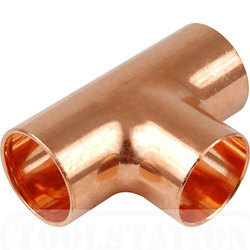 We are a reckoned trader and supplier of a wide range of Copper Threaded Tee. 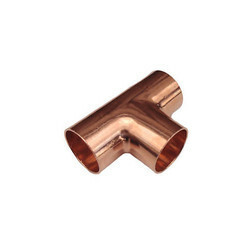 We cater Copper Threaded Tee at best price to our valued customer. Form: Reducing Tee, Unequal Tee, Equal Tee, Forged Tee, Cross Tee. A specification for a high-pressure thread compound that works well to lubricate. Onferrous alloys where any one or the sum of the specified amount of material. Alloy threaded tee containing two threaded holes with center lines that match those of a industrial fittings.